Alex has it all—brains, beauty, popularity, and a dangerously hot boyfriend. Her little sister Thea wants it all, and she's stepped up her game to get it. Even if it means spinning the truth to win the attention she deserves. Even if it means uncovering a shocking secret her older sister never wanted to share. Even if it means crying wolf. Told in the alternating voices of Alex and Thea, Adele Griffin's mesmerizing new novel is the story of a sibling rivalry on speed. I mean, look, I really do NOT like issues books. At all. I have no sympathy for the characters and I'm usually bored by the super predictible plots. I also don't like characters who do certain immoral things, I have no patience for non-action-packed plots, and insta-love is not my cup of tea. And, yes, all of those things are present here. But I'm gleefully ripping up all my rules (at least when it comes to Adele Griffin—hey, I'm not that flexible) because I LOVED this book! What are you getting yourself into? The chapters alternate between the two main characters, with Alex's sections written in third person and Thea's in first. I loved when Adele Griffin used this technique in her other sisters book Where I Want to Be and she uses it just as effectively here. Not only does the tense switch help differentiate the speakers (though this isn't necessary considering Adele Griffin's books always score highly on the Who's Talking Test), but they almost functioned as another brilliant layer of character description. Alex's emotional distance and secrets were emphasized by the third person narration style, whereas Thea's internal corruption was put on stark display through the use of first person narration. All You Never Wanted is a short book, but it is a book to be savored. Adele Griffin writes the kind of sentences I feel compelled to go back and reread because they just sound so good. The kind of sentences I'll read out loud because I like how they feel. The words come together in a way that's almost musical—words precisely chosen, sounds flowing and clashing up against one another, creating a beauty (and sometimes it's a horrific beauty) that stand all on their own. Though, much as I SAY the book should be savored, it's not like I was able to. 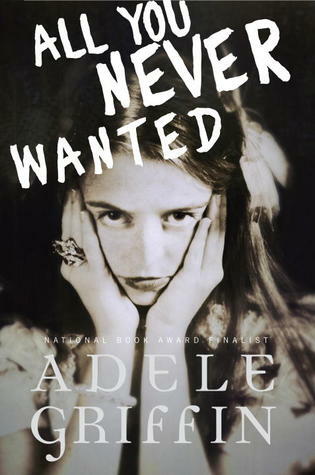 Reading All You Never Wanted was like putting a slice of chocoalte cake in front of me and saying, "Now make it last." Sure I might start out trying to ration it (only a bite here and there) but, yeah, I can't keep that up for long. Pretty soon I'd scarff that sucker down and there wouldn't be any cake left. That's pretty much what I did with All You Never Wanted. I had grand plans to "Make it last" but it wasn't long before I was putting life on hold, eyes glued to the page and nothing short of death capable of tearing me away from finding out what would happen next to these troubled sisters. (Luckily, unlike chocolate cake, you can do a do-again with books by rereading them). So I'm going to issue the Don't Make Plans warning. Seriously, don't even glance at the pages unless you're ready to commit. When I first got the book in the mail I thought I'd just take a peek. I was already in the middle of another book that I was enjoying and would be released soon, and All You Never Wanted wasn't coming out for almost three months. So I'd just take a peek. Famous last words. My household is lucky I wasn't the one cooking dinner that night. Also? Forget the blurb. It's not that it's inaccurate, but the book is so much more than that little blurb makes it seem. Ok then, what IS it about? Though it's short and it's contemporary (sorry, I always associate "contemporary" with "not much happening"), All You Never Wanted has a lot of stuff packed into a short amount of space. On the surface, it's a book about two sisters thrown into a rich lifestyle after their mother's remarriage. One is struggling with an eating disorder, cause mysteriously unknown for a significant part of the book, and the other desperately trying to remake herself from a wallflower bookworm into an even more popular version of her sister. It's about wealth and materialism. It's about jealousy, fear, anxiety, and control. It's about dating and parties, climbing the social ladder and the lies it takes to get there. It's about all these things, and more, but at it's core, All You Never Wanted is, I think, a book about family. So often in YA, parents take on an absent role and the teen characters seem largely (and unrealistically) unaffected. All You Never Wanted has the same absent parents, but every single thing the girls grapple with stems from this absence. The lack of parental support, guidance, love, and involvement is the elephant in the room, and though it is never directly addressed, it drives the story nonetheless. All You Never Wanted is tense, provocative, unsettling, and deeply emotional. I felt for these girls and desperately needed to find out what was going to happen to them, even though I didn't actually like either of them. And take note, I did say unsettling. There are a few scenes, though one stands out for me in particular (the confrontation with Thea right before she buys the dress), that are horrific to watch unfold but so brilliantly visceral. Adele Griffin does not shy away from or romanticize the problems these girls deal with. Their issues are on stark display, and is is as fascinating as it is disturbing. Though I think that's why I liked this book more than the typical issue book. 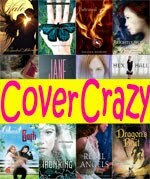 Usually issues books follow the same mold: cool main character with Very Bad issues that are usually glamorized or sugarcoated to make the main character look appealing to the reader and a neat, easy peasy fix at the end (usually complete with "I know it's a long road to recovery, but I'll make it" *fist pump*). I don't know whether I'm more annoyed by the eye-rolling lack of realism, the glorification of issues, or the predictability of the entire plot. Thankfully, All You Never Wanted doesn't fall into any of the usual issues-book traps. Not only aren't the girls held up on the cool pedestal, but their issues aren't played out to the point of becoming a predictable stereotype. The impetus of Alex's eating disorder is not revealed for a large part of the book, though it is hinted at in a way that led me down a total garden path. I thought I had it all figured out, and while I would have accepted that, it would have been disappointing in its Been There Done That predictability. But holy cow, I should have never even let the tiniest bit of doubt enter my head. Adele Griffin's plots are predictable only in consistently defying predictability. I was straight up shocked when the secret was finally revealed, and that's a very good thing. Also, note I said impetus, not cause, because I don't think that was the cause. I'd say her absent mother was far more the cause and The Event was just the avenue all of her feelings latched on to. Also, the ending? Oh my gosh, it is perfect! 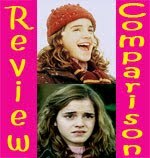 Movement has definitely been made in the sense that both girls end the book at very different points than they began the book, but neither has a firm resolution or happy ending. Usually I don't like that sort of open-ended conclusion, but in the case of All You Never Wanted, I can't think of a better way to end the book. Adele Griffin is the type of author where I've learned I need to ignore the blurbs on her books no matter how unappealing they may sound (contemporary?! Really??) and just go ahead and read them because I will LOVE them. They are brilliant, transcendant, powerful, and never fail to astound me. She's the type of author who is just so unbelievably good at creating characters that come alive off the page and sucking me into even the most unappealing plots that I need to just forget what I think I know about what I like and dislike and just READ her books. This would make a fantastic book club pick. Do you have any questions about All You Never Wanted that I haven't addressed? Hum makes me want to read it and it is normaly not my type, but then again i am learning not to have a type when it comes to reading every book is full of magic, some magic is just not meant for me though! I love the way you do your book reviews! 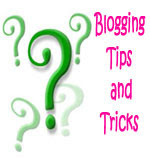 Leigh www.junglemum.blogspot.com will be popping back to check out your next review! Smalls, I know you don't give out 5s like I do so I always perk up when I see a 5 star rating from you. I guess I never had much of an issue with contemporary YA. It's just when they change from a story to a soapbox is when I get irritated. I haven't read Griffin's books yet so I requested it from NG to give it a try. Glad to know I made the right decision! I agree, I don't like how contemporaries so easily trend toward the soapboxy. I don't think this one does at all though. I hope you enjoy it! If not this book, then I definitely recommend Picture the Dead to you! Definitely agree that you cannot pick this book up when you have other plans. I was just planning to read a couple of chapters one night...and then I finished it! I could not stop reading. So I just went and ordered it because I know you love the author. I hope I get it soon. And I'm glad the "issues" weren't sugar coated. I hate that. Aw, I hope you enjoy it! THe issues definitely weren't sugarcoated. Especially Thea. Yikes, she is a troubled girl for sure! Yay! Glad you loved this one, Small. I just loved Griffin's writing style in Tighter and I hope to get to this one soon! Isn't her writing style marvelous? It stood out even more to me in this book. I hope you enjoy it! So glad to see a post from you. I've missed you! Have things in your life evened out yet? I need to read Adele Griffin's books. I know how much you love her. I'm not much of an issues person either, but I do get that some writers do it better than others. When you described that Griffin takes care of each word she chooses, I want to read it so bad now. Her writing is so beautiful. I hope you like it. I really don't like issues books at all, but this one was totally different, I thought. It skipped over all the marks I usually dislike. I wholeheartedly agree with so many of your comments here! I reviewed this one for Psychtember and was most impressed. Like you, I didn't really like either of the sisters that much (although I preferred Alex to Thea) but the story was compelling in an I-can't-look-away-from-this-impending-trainwreck kind of way. And Adele Griffin's writing is fantastic! She so skilfully uses subtlety and ambiguity. I know, I loved your review! I agree, Alex was a lot more likable than Thea, but Thea was fascinating. Another special shelf - woot - woot!!! The cover is really not attractive at all and the blurb isn't something that would have ever commanded my attention. Good thing I read your blog or I'd miss out on this sort of book. Dang, does this ever sound good! I really love your Adele Griffin fan-girl love - it's pretty awesome that you like things you would normally dislike just because that is how amazing she is! I just read my first issues book in YEARS, and wouldn't you know it: I actually really loved it!! It took me quite by surprise! So to hear that you also loved this issue book even though you don't normally, and that it didn't fall prey to the normal stereotypes that issue books tend to have - that is VERY encouraging to hear that! And the way you describe the writing? GAH, so amazing!